A serene neighbourhood of approximately thirty homesteads secluded just off the N84 where the villages of Cross and Glencorrib hem each other tightest [both close to Ballinrobe]. On some civil servant’s dust collecting ordnance survey mapping it’s officially plotted as ‘Houndswood North, South and Middle’. But centre stage in Houndswood’s performing theatre, where everyday life is enacted, there’s no division. Houndswood presents itself always as a full entity where everyone keeps a concerned lookout for each other. And, while they’ve climbed the highest rungs of the ladder of progress, it’s more than likely most Houndswood denizens still eat their dinner in the middle of the day. Highly unlikely too paninis or pasta forms the mainstay of their staple diet. Doubtful either if they’ve much truck with online shopping or bidding on eBay. They proudly preserve old routines around Houndswood. On a recent Friday, as evening dimmed the last rays of summer’s flickering light, John and Kathleen Langan’s home in Houndswood hosted the village stations. The house stations are one of the church’s oldest traditions. Its cultivating seeds were first set in Penal times when priests were forbidden to say Mass in public. After the repealing of the draconian diktat, the custom continued. The house stations became an integral part of rural culture. 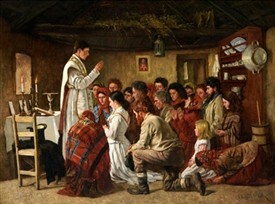 A typical scene from the early part of the century is perfectly captured by the artist Aloysius O’Kelly in his painting, ‘Mass in a Connemara Cabin’. The seanachaí Eamon Kelly regularly regaled his audience with humorous yarns concerning the subplots that unfolded around a village station. Homes in every township took their turn in accommodating the practice. Preparation began weeks in advance. The occasion prompted a purposeful justification to undertake a few home improvements. “Only for readying for the stations the house would have fallen to pieces,” became an oft-echoed maxim. It triggered a pebble rippling effect providing work for the local handyman and builders’ supply outlets. In his book, ‘Fifty Years Behind the Counter’ the late Headford businessman Kevin Duffy chronicled in great detail the extra revenue the stations generated for hardware shops and other commercial outlets. There was a pound in it for everyone. Timing was of the essence. As if by coincidence, rather than design, tinkers appeared days beforehand peddling paper-cut flowers, table centre-pieces and other decorative ‘thingamabobs’. 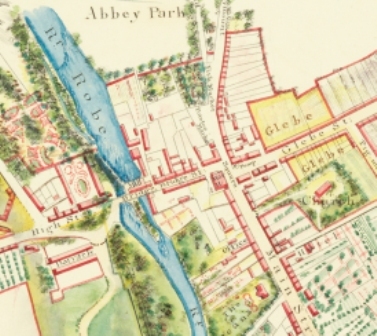 Stations provided the first sweetening taster of nouveau Ireland. It heralded the arrival of sugar cubes. No self-respecting home would set a parlour table for the priest’s breakfast without this contemporary condiment. A silver tweezers for gripping them too; sugaring tea was a delicate manouvere. Many a transferring came a cropper between bowl and cup in the transporting. Stations probably gave rise to the term, ‘good in spots like a curate’s egg’. Hosts went to great lengths to discover whether the priest favoured a hard or soft boiled egg. Nothing was sacrificed to chance. Along with a senior member of the household, one of the more upstanding local citizens was seated at the table with the priest to engage him in innocuous discourse. He (it was always a man, women were too busy on the day to be engaging in trivial chatter) was specially chosen on the basis of his conservatism and respect for the establishment. He could be fully depended on not to drop the proverbial clanger during the conversing. There was a rousing house shindig held later after all sacred formalities were dispensed with and the priest had departed the residence. 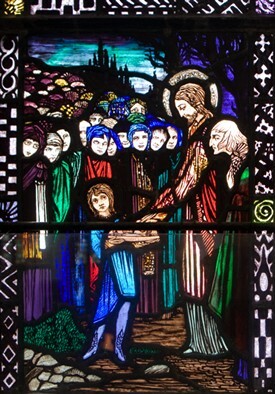 The station routine became one of the first sacrifices in Ireland’s pursuit of modernity and progress. They only exist in pockets now. Father Paddy Gilligan, a most accommodating and obliging of clerics who administers in Cong, Cross and The Neale has endeavoured to preserve the custom in his parish. And while at all times he affords the happening the respect it deserves, he also regards it as a social outing to be enjoyed. It’s exactly how it unfolded in the home of John and Kathleen Langan. No pomp or posturing. As homely an occurrence as one could happen on. John Langan holding court at his front door extending a genuine welcome to his neighbours, the Morans, Ryans, McEvaddys, Kynes, Hartes, McGraths, Philbins, McGintys, Costellos, Kearneys, Carneys and a communique of others who filed into their cosy home. His wife Kathleen and sons Michael and Thomas within among a meitheal assemblage tending to last minute incidentals. There was little needing doing. The Langans had prepared well. To Enda Morrin fell Mass serving remit. He was au fait with the onuses of the task. On arrival Father Gilligan traded nuggets of jovial and affable dialogue with the assembled. He orchestrated a quick rehearsal of hymns. The response engendered a rendition that, even to the untrained listening ear wasn’t of Mormon Tabernacle Choir criterion. There was a blessing and sprinkling of holy water on every portal and door jamb of the residence. The communion reflection was read by renowned Galway historian Peadar O’Dowd, who is married to John’s sister. John’s other siblings were present also as were members of Kathleen’s family, Nora, Darby, Teresa and Bridie. Langan’s conserved the great station ritual of providing food aplenty. The spread of meats and salads buns and cakes in a Houndswood kitchen made Bethsaida’s five barley loaves and two small fish fabled marvel seem like a light snack in comparison. There were bountiful servings for all and more besides. Accepting second helpings from Kathleen or her brigade of helpers was mandatory. Even a token refusal might have caused offence. John and Kathleen Langan’s stations epitomised best what the event entails. The gathering of neighbours and friends to join in the communion of Mass and partake afterwards in food and refreshments. A chance to mingle and chat in a relaxed setting providing a welcome aside from the everyday rush that consumes people all too much now. 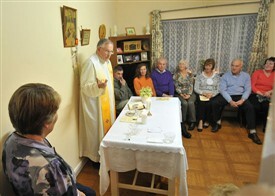 Father Paddy Gilligan is anxious the house station practice survives as a habitual occurrence in his parish. Houndswood gave his realistic aspiration a life-boosting injection and set the benchmark for a continuing trend. A true sense of community spirit is alive and well in Houndswood. They have another innovative idea for their next instalment. The villagers renovated an old derelict graveyard in the bailiwick, and plans are already afoot to hold the village station there next June. Tradition lives on in Houndswood. This page was added by Averil Staunton on 14/02/2015.